Deb's Cup of Tea: Something for me. This morning was bill paying time. I seem to be missing the phone bill but I'll bet it's in the pile to my right. I have paid everything else and have enough for a bit of travel this upcoming week. I even, and I hope you're sitting down, added 2 creditors to my online bill payers. For some reason, I got enough ahead on my electric bill that October's amount was $1.47. My water bill was the same way. I only owe $4.45 this month. It kind of seemed silly to send a check for each amount so I paid them online. Me! I did it! So, I have a bit extra and I can order that one item for one more special person on my Christmas list. Plus, I can order my annual Campbell's Christmas ornament. Of all the things I did last year, this is one thing I squeezed out of the budget. This year, it's easier to justify the purchase. I've been doing this since 1980. I have one big plastic storage bin that is nothing but Campbell's ornaments. I might be missing a year that has broken, I'll have to check. But I have not missed getting an ornament since 1980. It used to be that you had to send 2 soup labels plus a nominal amount, something like $3.95. I don't remember when they dropped the label requirement, but the price hasn't gone up all that much. I paid $6.95 for this year's. I don't live in Michigan, so I don't have to pay tax on the purchase. The blue of this year's ornament is quite distinctive. They have had clear glass, white glass, red glass, gold glass and I think there's a green glass one in the collection. I have enough that my whole tree could be Campbell's Soup ornaments. I don't actively collect much anymore. I used to go out of my way to get the small hand bells you see at tourist locations. If one strikes me as unusual, I will get it, but I don't go out of my way to add to the collection. But, this ornament is one thing I do actively get, every year, without fail. Ordered today, it should be here in time to adorn the tree in December. 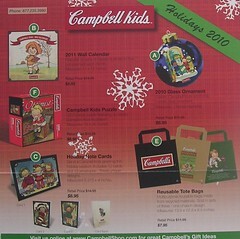 If you are interested in getting one of your own, you can find it here at www.CampbellShop.com. I'm actually eyeing the reusable bags. I have a few but it seems like it's never enough for those days that I do my monster shopping. Then again, it's getting close to Christmas and birthday time and people will be wanting suggestions. Reusable bags would be a great idea, not that I'm hinting.